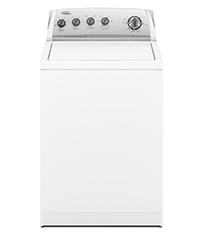 Whirlpool's WTW58ESVW model has a 4.0 cubic feet capacity. The model is energy star qualified, saving consumers 65 percent less electricity and 49 percent less water. The amount of water is conserved yet maximized using the triple spray technology. Cleaning is efficiently achieved through the Xtra roll action, used to place the laundry at the bottom for an extra wash. Delicate material can be managed using the controllable bleach dispenser and fabric softener. - The model offers all kinds of cycle options, including heavy duty, hand wash, normal, casual, prewash, soak, bulky items and hand wash.
- Xtra roll action plus agitator feature provides double rinsing for cothes. - Six water temperature options allow for careful and suitable washing for any kind of fabric and stain. - Energy Star qualification saves customers on electricity and water bills. - White porcelain wash basket provides protective placement for clothes inside the machine. - Triple spray technology uses auto load sensing to know the right water amount and temperature indication. - Fabric sense wash system chooses the appropriate agitation speed, temperature setting, cycle type, fabric kind, and cycle time according to the load?s material. - Machine measures 43 inches in height and 27 inches in width, making it suitable for any room size. The washing machine?s overall capacity is suitable for large families. Despite this large capacity, the model still manages to save more electricity and water. All the advanced features, including the adjustable settings, come in this model at a relatively affordable price. The various wash cycles make the laundry chore easier to manage, particularly for clothes with difficult stains. The six water temperature and cycle settings can be specified to treat clothes according to their fabric sensitivity, stain, and material. Users won?t experience discoloration or wear and tear damage from the wash. Unfortunately many have complained the machine makes a lot of noise. Those who plan on doing laundry late at night are not advised to use this model. Others have also complained that the water level used is too low. Although there are pre-settings, it is sometimes not enough for the actual amount you are loading. - Reasonable size for a medium room. - Varying wash cycle options. - Easy control settings such as the bleach dispenser, rinse, and fabric softener option. - Includes a bulky items cycle, prewash cycle, soak cycle, and hand wash cycle. - Fabric sense wash system takes care of sensitive material. - Six water temperatures have a die range. - Affordable price, allowing one to save more money for other expenses. - Too noisy during wash cycles. - Water setting amount is too low. - Varying temperature and cycle options might be too confusing for users after basic laundry needs. - Some consumers complain of low water level ripping their clothes apart. - Lid cannot be opened again to place more detergent. Instead, the machine adds according to the highest level. Ive had for 2 years and complain everytime i use. Cant afford another though. Did figure out if you set on bulky items it will fill. Even tried opening lid like they warned against ans still couldnt trick into filling to top while on heavy duty load. Clothes dirty and stink or have soap residue. Fabric softener dispenser gets clogged and slimy. Want to cry i am a single broke mother stuck with this POS!!! doesn't even deserve one star! This is the worst washing machine manufactured. Do NOT buy it (I think it is discontinued) but if there are still some around...DO NOT buy it! I agree with all the reviews posted and will never buy another Whirlpool appliance in fear they will be as terrible as this washing machine. A total waste of money. Even the repairmen say it is really the worst machine they have to work on and usually can not repair it even calling the Whirlpool technician help line. Probably one of the reasons it is discontinued. I am now on my way out the door to buy a new machine (not made by Whirlpool!) I can not continue to use this machine any longer. Again, what a waste of money! I bought in 2009 for $850 and now have spent over $400 trying to fix (including "professional repairmen") and still not working!!!!. Piece of crap as far as I'm concerned. the parts look good but "qualified repairman" seem to have to repair by swapping in parts until something works. STAY AWAY FROM THIS MACHINE. IT CAN'T EVEN BE FIXED EASILY. The washer wtw58ES1 the higher grade ran and did great till 05/09/2011 we bought it 05/18/2010 now it agitates before the water starts to fill up,stops midway thru rinse.then fills up with water no matter the size load repair man due to visit on 05/10/2011 can't wait to hear what's wrong and wait to see how long before it breaks down again,my old washer worked 12 years without a problem a G.E and G.E won't stand by their product's or I would have bought a washer from them,I had it with an A.C from them and the no service.the N.C attorney general couldn't get G.E to cover their product during the 12 month warranty and the extended warranty had not even started yet! I bought this washer just in the beginning of February, and I have already had it serviced on twice! This is the worst machine ever! I have little kids and their socks got stuck underneath the agitator. Then it got stuck inside one of the hoses, and this will not be covered under my warranty! So I have to pay to get this fixed. It is very loud, and I opened it to add another piece of laundry and now it won't add water at all! Have unplugged it and took out all of my laundry and this will still not work. I would NEVER recommend this to anyone! Worst washer ever! The worst thing is that I just got rid of another Whirlpool front loader because it was giving me the same problem! Going out and buying a new washer has not help! DO NOT BUY! All my life, I have had Whirlpool washers ONLY as they always were the best. This is the worst machine I have ever had. It is almost one year old and I have been complaining from day one. I have had service people from 2 companies that say it is operating as designed. Really needs to go back to the drawing board. I am trying to get Whirlpool to work something out with my dealer. Constantly gets off balance despite careful placement of laundry and not overloading. Machine moves violently around the room no matter what we tried. I was told to use do all washes on the delicate cycle for slower movement. Make no mistake there is nothing delicate about it. I now have to wash any of my delicates by hand. I will get rid of this machine once I know which one is better even if it is a different brand. Water level has to be tricked. Tears clothing, towels and rugs. I truly hope that Whirlpool will do the right thing and stand behind their products. Don't know if Whirlpool will allow this to go on their comment page ... however, as a 67 year old woman I expect my purchases to meet my expectations ... I believe the company should GIVE me, and perhaps you too a minimum of their advertised one-year warranty, one that I shouldn't have to pony-up and pay for. Since purchasing this washer just a shy from a year, I had to have a repair person in to replace all the knobs ... darn machine wouldn't rinse! Now, when I rinse, I don't dare NOT put the cycle on 2nd rinse. It also leaves tons of lint in all the seams of my slacks, and turns my clothes inside out, including my pillow case for goodness sake! I am assuming the inside-out thing is due to the roughness of the machine. When I complained about this to the company, along with the fact that I not only wanted a replacement of another one of their machines, and that my clothes are being so roughed up that they are showing considerable wearing, they alluded to the possibility that I don't take care of my clothes. Hello ... I work for a high-end clothing store and have for years ... NEVER have I seen such wear on my clothes. Yes, I can give Whirlpool the benefit of the doubt and admit, "Perhaps the manufactures of my high-end clothing are sending too much of their workmanship oversees, this does NOT excuse that I am still in distress. Let's team up and ask for something better than an excuse that we're the problem!!! Worked great for five months. The washer smells of mold and mildew. I have tried everything I can think of--vinegar, bleach, Affresh...nothing helps. If I do not keep the door to the laundry room closed, the whole house will smell of mildew. I guess my next step is to take the machine apart and clean the drum. My machine is still under warranty. Does anyone know if this kind of problem is covered by warranty or will the manufacturer think that I've caused the problem and not cover it? Washing is okay. Okay, when people said this machine was noisy, I didn't believe HOW noisy! It sounds like a monster in our laundry room even with the door closed! I purchased this because it was a resonable price and matched my dryer. Do not get this machine! Compared to our old Kenmore washer, this one does not measure up. Clothes come out with soap and lint on them. The whites get dingy after a few washes. We must run the extra rinse to get rid of the lint. We were told to use just a little detergent but the clothes didn't even get clean. I don't like the water level either. I voiced my concerns to Whirlpool and am expecting a repair service representative next week. I was very, very happy to receive such a quick response and want to thank customer service for their professionalism. Now, I can only expect this rinse cycle challenge will be corrected. I replaced my last Whirlpool after having it do a great job for over 10 years with no service and a physical move out of state. The compressor just finally went. I am trusting that this new purchase will provide me with a like number of years too. Just bought this model 6/8/10 & am still learning how to use it to max efficiency. I am happy w/it so far for the price we paid, but I do agree that w/the water level issue. The good thing is that U CAN open the lid once it stops filling w/water, & it will re-start the water level adjusting it to the weight. Personally, I think they should have just left the water level issue alone. Why mess-up a "good thing" that works? Some things are better left alone! Oh & it doesn't work w/powder soap @ all- salesman didn't mention that!